3 - 3..............Gina von der Weyermühle. 4 - 4..............Anouk von der Weyermühle. 4 - 4..............Boris von der Weyermühle. 4,4,5 - 5........Bingo von Ellendonk. 4,4,5 - 5........Cona von Niederkassel. 5 - 5..............Akim von Vaciweba. 5 - 5..............Alfa von der Weyermühle. 2007: 92-88-90 = 270 points (1st). 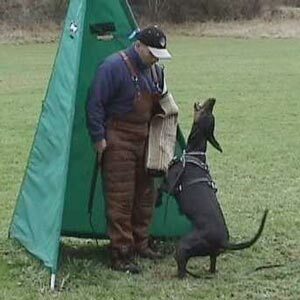 Briska's Senta was the winner of the Swedish IPO Championship for Dobermanns in 2007 and passed the Swedish Körung. She also passed the ZTP with 1A rating for character and SG for conformation and is PHTVL/PHPV free. Senta's sire, Bronco von der Doberwache, was a Police trained dog who competed at the working FCI Championship in FH2 and working IDC World Championship in 1989 and 1999, he lived to 10½ years of age. Her dam, Briska's Milla, passed the Körung and working/breeding tests in Sweden. Yennie: SchH 3, IDC-WM participant and passed the ZTP with 1A rating for character and V for conformation. She is dam of the vom Blitzkrieger “S” litter (Sanka, Shaitan, Sierra); Briska's “C, E” litters (Chico). Yra: dam of working Security k-9 Vonchienloup Akil.